Until recently, a number of marketed products had considerable levels of radioactivity. 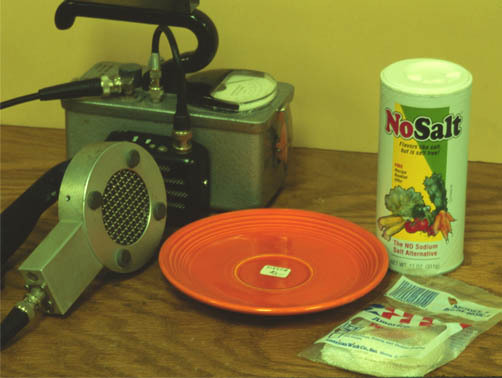 Shown with the Geiger counter are a piece of orange "Fiestaware", a mantle from a camping lantern, and No Salt salt substitute. 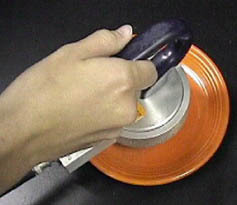 The orange dish gains its radioactivity from uranium oxides in the orange glaze. This dish measured 20 millirad /hour when the counter was placed directly on it. The mantle measured 9 mr/hr. The No Salt has a lower level of radioactivty from the potassium chloride it contains, measuring 0.2 mr/hr. Orange Fiestaware has long been recognized as one of the most radioactive commercial products you could buy. It was referred to as "radioactive red". A non-radioactive version has now replaced it. The orange dish gains its radioactivity from uranium oxides in the orange glaze. This dish measured 20 millirad /hour when the counter was placed directly on it. 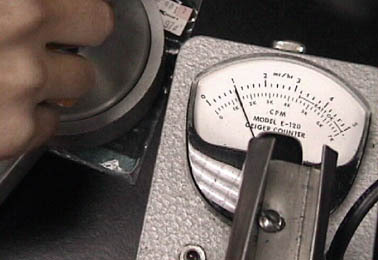 In the illustration below, the sensitive survey meter with its thin receiving window is placed directly on the dish. The needle reads 2 with a multiple of 10, for 20 mr/hr. Most uranium compounds are colorful. This orange color may come from the uranium minerals kasolite and curite, which show a vivid orange color. Fiesta ware was produced by the Homer Laughlin Company of West Virginia which introduced the line of dinnerware in 1936. There was a choice of five colors: red, blue, green, yellow and ivory. Red was the first color that the company selected when designing the product, and blue was the second (these were the colors of the Fiesta ware that Andy Warhol collected). Since the idea was to mix and match the dinnerware, the five colors had to be compatible. Fiesta red has always been the most popular color even though it was the most expensive. The higher price was due to the cost of the raw materials and the fact that the production of the red required a greater level of control during the firing process. The red color was achieved by adding uranium oxide in the glaze - measurements have indicated that by weight, up to 14% of the glaze might be uranium. How much glaze was eemployed per plate is unclear but it has been estimated that a single plate contains 4.5 grams of uranium (Buckley et al). Piesch et estimate the glaze thickness at 0.2mm. 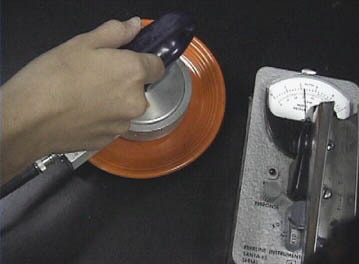 Since its uranium could be used in the production of an atomic bomb, Fiesta red became a victim of World War II when the US government confiscated the company's stocks of uranium. Fiesta red disappeared until 1959 when production resumed, this time using the depleted uranium left over after uranium enrichment for weapons use rather than the original natural uranium. In 1969 the entire Fiesta ware line was discontinued, and in its place the company produced what was called Fiesta Ironstone. The latter, which was only manufactured in Fiesta red (aka Mango Red), didn't last long. It was discontinued in 1973. This was the end of Fiesta red. Years later, in 1986, a new line of Fiesta ware was introduced but without the red color. The above history was excerpted from "Radioactive Consumer Products, Museum Directory", 2009, Oak Ridge Associated Universities, where samples of Fiesta ware were exhibited. That guide also has details about measured radiation doses associated with the uranium-glazed ceramic products. Buckley, et al., Environmental Assessment of Consumer Products Containing Radioactive Material. Nuclear Regulatory Commission. NUREG/CR-1775. 1980. Piesch, E, Burgkhardt, B, and Acton, R. Dose Rate Measurements in the Beta-Photon Radiation Field from UO2 Pellets and Glazed Ceramics Containing Uranium. Radiation Protection Dosimetry 14(2). 109-112, 1986. Until recently, camping lantern mantles had a considerable amount of radioactivity from the thorium illuminant used on the fabric of the mantle. 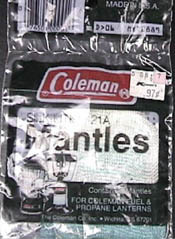 Packs of mantles like the one shown averaged 9 mr/hr. The one above is showing 10 mr/hr since it is on the 10x scale. Recently obtained mantles showed no measurable radioactivity over background.